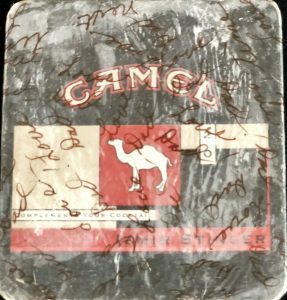 An old Camel tin (3.25″ x3.5″) lay on a shelf, abandoned to sleeker shapes, more ornate designs, and less controversial products. Its faded, scratched edges spoke of frequent use. The tin’s patina was naturally aged. It could make a wonderful altered tin project I reasoned. The elements, once spread across several different drawers forced me get serious about the purpose of my altered tin. These cherished recollections would be especially meaningful for Mom. What about making an altered tin for her? 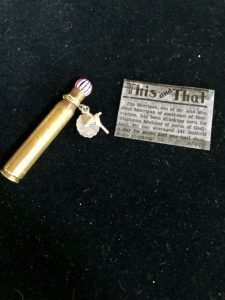 With loving care, I installed a patriotic bead on the open end and wrapped my shell casing from the 21-gun salute at his funeral with a medal and a cross. As my hands worked, my mind ticked off ideas. My Dad valued God, family and country. In that order. A good neighbor and citizen, he lived to serve. 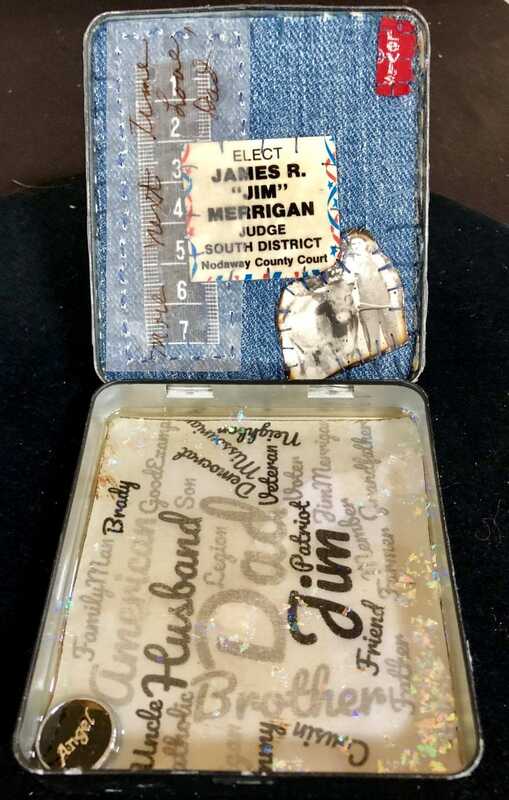 A matchbook cover from the campaign for his local judgeship fit into the box lid. I used resin paper techniques to preserve the matchbook cover, the picture, and that wonderful signature line and then hand-stitched them to other elements on denim, his daily uniform. To one side, a piece of tape counted to seven, representative of seven children. 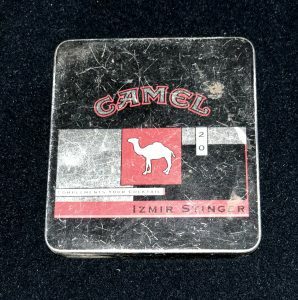 Inside the tin on the bottom surface, Dad’s many roles were tea-dyed and then encased in resin. An “angel” charm provided the perfect summation. I envisioned him watching me place it. I elected to finish the project in his handwriting with the lines I’d traced from his letter modge-podged to the top of the tin. The roles he took on were on the bottom. My altered tin provided a truly heart-centered maker opportunity for me. It is a memory-keeper extraordinaire that I plan to send to my 90-year old Mother. No doubt she’ll recognize the hand-writing on the tin. What special mementos will you include in your altered tin?